School psychologists play a critical role in creating ongoing, meaningful assessments of student learning and progress as a key feature of effective educational systems. Schools collect a profusion of data about student and school performance, including screenings for academic and behavioral concerns, performance on classroom assignments and standardized tests, attendance and truancy data, discipline reports, school climate and safety indicators, and student and teacher engagement. 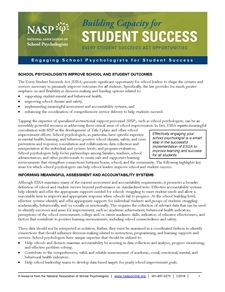 It is imperative that school psychologists work with principals, parents, administrators, policy makers, and other relevant stakeholders to ensure that schools implement evidence-based, comprehensive assessment systems that accurately identify schools that are succeeding and schools that are struggling to educate all children. The Every Student Succeeds Act (ESSA) provides states great flexibility to develop accountability systems that provide meaningful data to drive improvement efforts in struggling schools and recognize successful schools. ESSA seeks to improve the quality, not the quantity, of assessments, and allows states and school districts to use funds to identify and eliminate unnecessary tests and improve existing assessments. Further, ESSA replaces the overly punitive adequate yearly progress (AYP) requirements with a comprehensive model that seeks to support struggling schools. At least two indicators of student academic achievement—One indicator must be based on student performance on state assessments while the second indicator may be based on student growth, formative assessments, or other valid and reliable indicators the state wishes to include. At least one indicator of school quality or student success such as student engagement or school climate and safety. Data could include measures of school climate and students’ nonacademic skills, such as: rates of chronic absenteeism, suspension and expulsion rates, perceptions of school safety, social awareness, self-management, self-efficacy, and growth mindset, which is defined as an understanding that academic skill is not an inherent, fixed trait but one that can grow through effort. Depending on what data is collected, it can be used to identify and address individual students and to inform systems-level school improvement efforts. Many schools and districts currently collect this data, but using it for accountability purposes is uncharted territory. ESSA requires that states and local education agencies (LEAs) engage in meaningful consultation with appropriate specialized instructional support personnel when designing state and local Title I accountability plans to improve student outcomes and school success. School psychologists are experts in assessment, with particular expertise in appropriate measurement of nonacademic characteristics of student performance and systems-level factors, such as school climate, that can affect student performance. This expertise should be used to ensure that unintended consequences of nonacademic measures (lack of reliability, inflation of rating of personal adjustment scores, and interventions focused on increasing ratings rather than instilling concepts) are avoided. It will be essential for school psychologists to work with school leadership to critically examine each indicator to determine the reliability and validity of each measure to avoid response biases, inflated scores, and misinterpretation of results. For example, having a greater awareness of social–emotional terminology may impact how a student rates themselves on a rating scale, but it may not be indicative of their actual behavior or reflect outcomes associated with school improvement efforts. 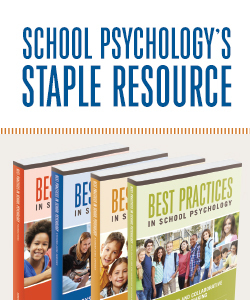 School psychologists are often an untapped resource. When utilized appropriately, we can help schools and districts use limited dollars more effectively while simultaneously improving school and student outcomes. As states and districts begin to develop assessment and accountability systems, school psychologists can offer significant consultation and technical assistance. School psychologists’ training in evaluation, data collection, and interpretation can help ensure decisions made about individual students’ needs, learning supports, and the school system are based on appropriate evidence gathered through a needs assessment. Distinctive training in data-based decision-making allows school psychologists to take the lead in evaluating the impact of comprehensive learning and mental health supports on academic achievement and student growth indicators. School psychologists have advanced knowledge of multitiered systems of supports, and they consult with classroom teachers on the use of evidence-based formative assessments and regular monitoring of student progress to inform instructional efficacy and to improve students’ mastery of curriculum. School psychologists help schools and districts maintain accountability through effective collection and evaluation of multiple data sources to determine the needs of students and supports. As experts in the area of individual assessment, school psychologists understand and can assist others in developing measures that are comprehensive, valid, and reliable indicators of academic skills, social and emotional functioning, and mental and behavioral health. School psychologists use their expertise in program evaluation and research to help monitor school wide systems that support positive climates for learning and regularly evaluate the breadth and effectiveness of positive interventions and supports. School psychologists possess a comprehensive understanding of research and interpreting data in applied settings. School psychologists use these skills to evaluate and apply research as a foundation for determining effective practices at the individual, group, and/or systems levels. This handout provides an overview of assessment and accountability in ESSA's provisions relevant to school psychologists.